Health leaders have never been more important to ensuring the success of our health systems. The College is proud of its members for the incredible difference they make every day to the lives of Canadians. 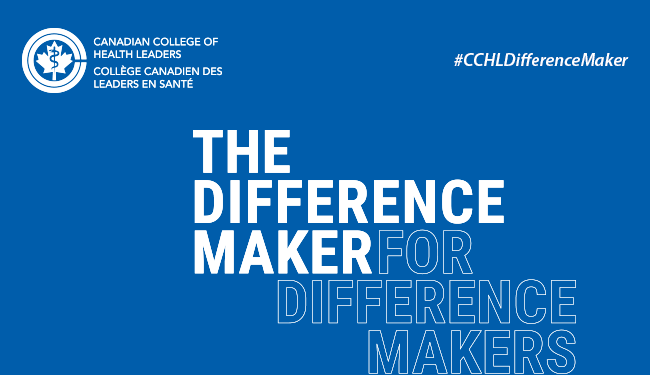 This is why we have launched the #CCHLDifferenceMaker campaign. We know how strongly our members and partners feel about what the College offers to health leaders, and to our health system. This campaign is about sharing the stories of health leaders; exemplifying why we need health leadership and the College’s vital role in helping support that leadership. Share your #CCHLDifferenceMaker story. It’s easy and our campaign resource page has all of the tools you need to get involved.